10bet have a promotion that runs every week from Monday 00:00 to Sunday 23:59 whereby you bet 5 x £10 inplay and receive a £10 free bet. 10bet's odds aren't great but if you can find 5 close matches on football events at half time then you can make a quick profit. All events and markets eligible, inplay bets only. MUST OPT IN. This offer is best done on Saturday's when the premier league games are on. There are normally 8 matches on at a weekend so you can find 5 decent matches at half time. To trigger the £10 free bet, you must place 5 bets of at least £10 at odds of 2.0+ inplay. The easiest way to do this is to pick a big day of football and wait until all of the games are on a half time break. Then compare the back and lay odds for each match manually (inplay isn't on the oddsmatcher unfortunately. Opt in first. Open up 10bet and your exchange and find a close match between the back and lay odds for any event and any market that is currently inplay. The reason we stick to half time is so the odds won't move because of a goal. If you place a back bet when a goal is scored, your lay price could shoot up causing a huge loss! 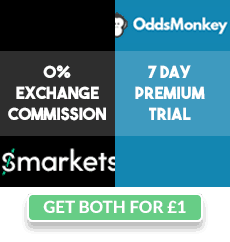 Bet £10 on 10bet on the inplay market of your choice. We would normally advise a maximum loss of 50p however 10bet's odds aren't normally great, so you can take a loss of up to 80p for this to still be profitable. After your bets have settled you will receive a £10 inplay free bet for any inplay market. This offer can't be combined with any 10bet offers as the bets have to be in-play, however 5 quick and easy matches make it a good offer to attempt on busy days. Don't forget to OPT IN. 10bet's odds aren't great so check out all markets of a game, not just match result (over/under goal markets tend to be good).